This brand new program helps your students learn to make wise choices about nutrition and fitness as they sort through today's ever-expanding array of food options. Positive approach encourages students to understand nutrition guidelines, gather and evaluate information, and use their resources to solve practical everyday nutrition and fitness problems. Eating for health is emphasized in a light, enthusiastic style that examines the enjoyable and diverse aspects of food. Teaches students to recognize nutritious choices in snacks, convenience and restaurant foods, and home cooking. Food Preparation Handbook is bound in. It provides flexibility in teaching traditional food preparation and current safety skills in an intriguing, visual format. 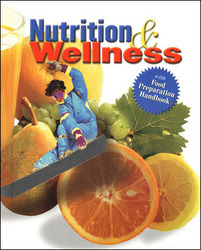 Emphasizes the Family and Consumer Sciences Education National Standards for Nutrition and Wellness. Fueling Up for Fitness helps students understand fitness and how to apply food choices for active living and weight maintenance. Student Text has 576 pages.